The Check Point 1140 appliance is an all-inclusive, centrally managed, security appliance for branch offices and remote sites. Built on the Software Blades Architecture, the 1140 Appliance offers the same enterprise-class Check Point security that is used by all of the Fortune 100; on a compact desktop form factor. In the age of global business and increasingly more distributed workforce, remote and branch staff demand access to corporate resources in order to work effectively and efficiently. However, even a small data breach can expose growing companies to crippling lawsuits, penalties and loss of reputation. As hacking techniques and malware evolve, the threat of data loss compels companies to further restrict access to sensitive data. With limited IT budgets and resources, branch offices need an inexpensive, yet effective solution to provide secure access to critical resources from anywhere, while minimizing the risk of a data breach. The Check Point 1100 Appliances are a simple, affordable and easy to deploy all-in-one solutions for delivering industry leading security to protect the weakest link in your enterprise network-the remote branch offices. Protect against cyber threats with Check Point Threat Prevention Software Blades. The Check Point 1100 Appliance is an all-in-one, centrally managed, security appliance for branch offices and remote sites. Built on the Software Blades Architecture, the 1100 Appliance offers the same enterprise-class security used by all Fortune 100 companies-in a compact desktop form factor. The 1100 Appliances, available in 3 models to match the number of users protected, are ideal for small offices with from one to fifty employees. A wide variety of network interface options are available including 1GbE Ethernet ports, 802.11b/g/n WiFi, ADSL and 3G wireless connections. These compact desktop appliances deliver outstanding performance of 1.5 Gbps firewall and 220 Mbps of VPN throughput. For local management and support in a small office environment, an easy and intuitive web-based local management interface is available. Enterprises who want to manage security from a central office can leverage Check Point Security Management or Multi-Domain Security Management to remotely manage and apply a consistent security policy to hundreds of devices across the field offices. Best-in-class Integrated Firewall and IPS 1100 Appliances include the industry's most proven firewall technology, based on the same Check Point technology that secures the Fortune 100. Together with Check Point's proven IPS (rated “Recommend” by NSS); the 1100 Appliance ensures protection of remote sites from both known and unknown threats. Next Generation Firewall Capabilities Check Point's Application Control and URL Filtering Software Blades unify web site access control with application control for improved security and lower cost. Identify, allow, block or limit the use of thousands of applications, including Web 2.0 and social networking, regardless of port, protocol or evasive technique used to traverse the network. Combined with the Identity Awareness Software Blade, administrators can create granular policies to strike a balance between user application usage and security, productivity and resource utilization. Secure Connectivity Ensure secure communications between site-to-site and remote users with IPsec and SSL VPN. 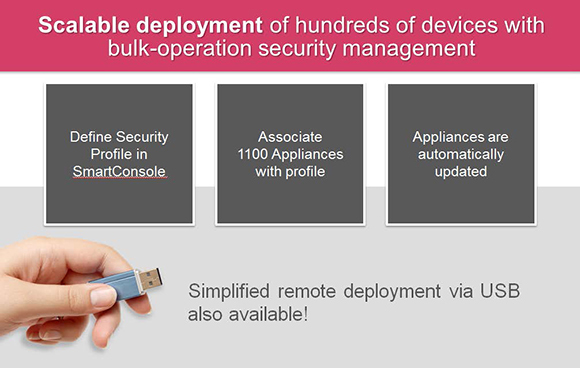 Offering multiple connectivity methods (including Check Point's VPN clients, SSL and mobile clients), The 1100 Appliances ensures secure connectivity wherever you go. Anti-Malware Dynamic Protection The 1100 Appliance's enhanced Antivirus Software Blade uses real-time virus signatures and anomaly-based protections from ThreatCloud™, the first collaborative network to fight cybercrime, to detect and block malware at the gateway before users are affected. 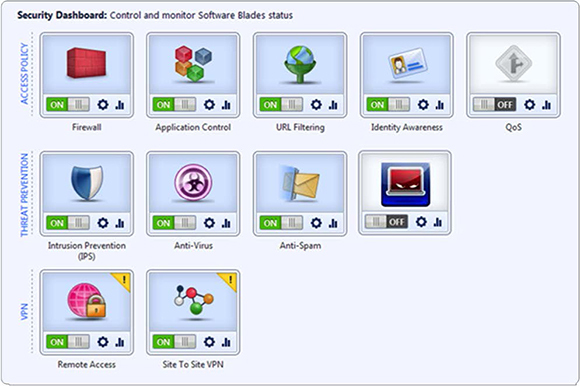 Anti-Spam and Messaging Security Check Point's Anti-Spam and Email Security Software Blade provides a comprehensive, multidimensional approach to protect the email infrastructure-providing highly accurate anti-spam protection and defending organizations from a wide variety of virus and malware threats delivered within email. Local Management A simple Web-based management interface allows administrators to secure a small business in minutes. The setup wizard enables a pre-set security policy. 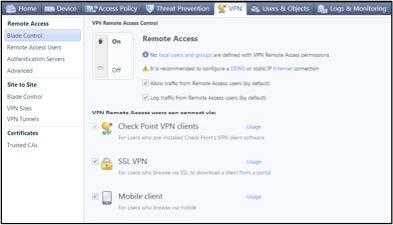 Customize the device configuration and security policy with the web-based management interface. Monitor the device and security with easy-to-understand logs and reports. Central Management Administrators can define security policy for the entire network-including internal security, main sites, and remote sites-from a single, centrally located Check Point Security Management server. With SmartProvisioning™, a profile-based management approach designed for large-scale deployments, administrators can define a single security and device profile and apply it simultaneously to thousands of 1100 Appliances-dramatically reducing deployment time and administrative overhead. Ideal for Remote Office Networks 1100 Appliances are full-fledged network routers that include a LAN Switch and a dedicated DMZ and WAN port. The optional integrated ADSL modem eliminates the need for a separate external ADSL modem. 1100 Appliances also include a USB and PCI Express card slot that allows administrators to plug in a compatible third party 3G modem, providing an additional WAN connectivity or a redundant Internet link for maximum reliability. 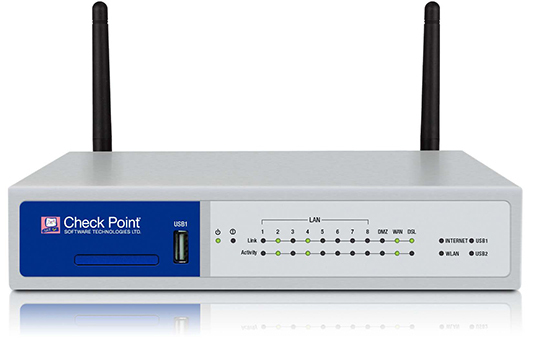 Secure Wireless Connectivity The 1100 Wireless Appliances include a WIFI access point (802.11b/g/n) that supports WEP, WPA and WPA2 authentication. Embedded GAiA-The Unified Security OS Check Point GAiA™ is the next generation Secure Operating System for all Check Point appliances, open servers and virtualized gateways. GAiA combines the best features from IPSO and SecurePlatform into a single unified OS providing greater efficiency and robust performance. GAiA secures IPv4 and IPv6 networks supporting complex network environments by supporting dynamic routing protocols like RIP, OSPF, BGP, PIM (sparse and dense mode) and IGMP. Download the Check Point 1100 Appliance Datasheet (PDF). Download the Check Point Appliance Comparison Chart (PDF). Download the Check Point New Appliances Brochure (PDF). Appliances license cannot be used on any other system other than the dedicated appliance. When building a cluster configuration, all cluster members must be of the same appliance. All 1140 appliances include Firewall, VPN, Advanced Network & Clustering blades, Identity Awareness and Mobile Access (for 10 users) blades. Pre-packaged blades are not accumulative and cannot be extracted from the appliance. The software license for the 1100 appliance is generated based on the system s unique MAC address (not the IP address assigned to the system). License includes support for central or local management. Recommended for up to 25 users with all Next Generation Threat Prevention blades enabled. On site RMA services are not available on all 1100 appliance.